[PDF] Book Yourself Solid: The Fastest, Easiest, and Most Reliable System for Getting More Clients Than You Can Handle Even if You Hate Marketing and Selling | Free eBooks Download - EBOOKEE! Description: The new edition of the bestselling business development guide Book Yourself Solid, Second Edition reveals why selfâ€“promotion is a critical factor to success, giving you a unique perspective that makes this guide much more than an ordinary "how to" manual for getting more clients and raising a business profile. Book Yourself Solid, Second Edition enables you to adopt the right promotional perspective and provides the strategies, techniques, and skills necessary to get more clients and increase profits. Through verbal and written exercises, you?ll discover the keys to developing a strong marketing plan and brand image. Features unique, personalized, updated social media marketing strategies for service professionals Provides new pricing models and sales strategies for simpler selling Delivers fresh networking and outreach strategies guaranteed to take only minutes a day Offers new solid product launch strategies and tactics for creating instant awareness Author a New York Times bestseller, TV personality, and highly recognized professional speaker Get the proven tools you can put into effect today with Book Yourself Solid, Second Edition , and watch your business grow exponentially! 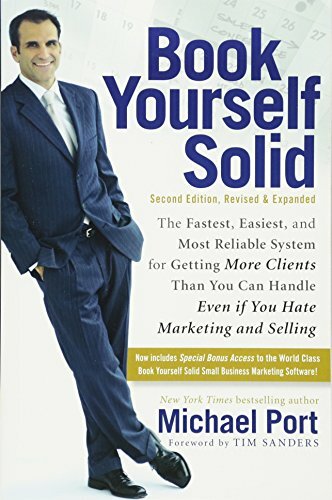 No comments for "[PDF] Book Yourself Solid: The Fastest, Easiest, and Most Reliable System for Getting More Clients Than You Can Handle Even if You Hate Marketing and Selling".